Are Rift players the better people? There’s the Carneval of the Ascended world event currently going on in Rift and having re-subbed a couple of weeks ago, I did of course jump into the whole affair while trying to remember how to play my old character. Out of a whim one night (and desperation), I decided to use general chat to get some guidance, not expecting much in terms of help on boring noob questions. I was shocked to be proven so utterly wrong. Not only did I receive a perfect answer within the minute, I received several more tells from different people. My rusty thank-you muscles were sore afterwards. Surely that was first time luck though, some rare cosmic constellation working in mysterious ways! I had to try again. 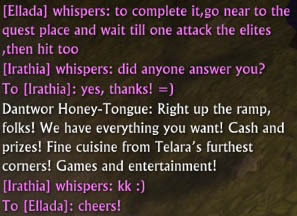 What is it with these friendly, helpful Rift players??? Sadly, I am a complete stranger to this level of support. I gave up in WoW years ago and other MMOs that will even feature beginner channels (such as AoC), were just as big a disappointment. I can only begin to speculate why Rift’s community is so different – is it the cosier size? The numerous WoW quitters? The fresh air in Telara? ….Or do I just happen to find myself on a freak server? Whatever it is, I am duly impressed. Maybe the stars do have something to do with it after all, though; Kleps just ran into an outrageous bunch of Robin Hoods recently, in WoW of all places. If that’s not supernatural, I don’t know what is! Which MMOs are you holding on to? A comment by Telwyn on Syp’s most recent topic got me thinking of all the MMORPGs I currently got installed on my PC. I used to be such an exclusive WoW-player for some time, but gradually when things changed in that department, I returned to older games or started to pay new titles more serious attention. There used to be a time when religious “MMO fatalism” forbade such unfaithful practices, but these days a great part of any MMO player base will actually leave and come back, re-sub or sneak around several online worlds simultaneously. The big, dramatic quitting gesture is more and more becoming a thing of the past. And a good thing too. There are currently five MMOs linked on my desktop, vying for my attention. And I realize that there’s no common pattern (or in places no sound logic) in why I choose to keep them installed on my PC (which is rather desperate for space) for that long. The reasons why we hold on to some MMOs can vary greatly (apart from actually playing them actively); sometimes we genuinely believe we’ll be back, sometimes we’re just too lazy to uninstall…but in other cases? Allods Online; Allods is my secret MMO crush. I’ve long decided that I cannot play Allods due to its forceful RMT concept and I do not intend to go back and retry in fact ever again. Still, I cannot bring myself to uninstall this MMO, I just love the Arisen so, so much! Call me a weirdo, I will hold up my Allods torch for some while to come, damnit! Age of Conan; I re-subbed to AoC a few months ago when I was still deluding myself that it might fill the dark days of November and December and take my mind off the GW2 wait. Going back once more and testing the new PvP server was fun for a while, but it didn’t last as long as I hoped it would. Too much of the old concerns are still very much alive in Hyboria and they don’t get less vexing the second time around. I’ve no idea why I haven’t uninstalled the game yet – I think I should do that now. Rift; I’m actually playing Rift again at the moment, after having been un-subbed for a very long time. I always meant to re-visit the bard class and lo and behold ended up enjoying the rogue path! The moment I re-subbed, I was instantly reminded of all the things I liked about Rift initially; this time around I am actually more relaxed about it, exploring and leveling up in peace together with my partner. We both know that Rift is just a temporary distraction, but I am very glad I decided to give it another chance. I guess that shows that not every MMO needs to fulfill that big, all-encompassing purpose. Minecraft; Okay, not strictly speaking an MMO, but the way it can be played on private servers comes close. MC is one of those online worlds I will hold on to for a long time – if only to see how things progress in the future, what features will get added, new biomes or creatures to find and explore. I still feel very new to MC and its initial fascination has not diminished, while it’s also the perfect game to have as your “casual backup plan” whenever you want to go unwind. I’m an on-and-off guest there and the place I’ve built for myself is magical and special to me. Not uninstalling this one in any foreseeable future. WoW; Yep…I have not uninstalled World of Warcraft up to this day. I can’t say why I’m holding on to it, certainly not because I harbour any secret wish to re-sub. I don’t. I’ve long learned that lesson. And yet, somehow it was too painful to get rid of the game entirely. I’ve gotten so used to the icon on my windows task-bar over the years…it’s almost as if WoW has become “desktop furniture”. I’ve cleaned out most folders to free up disc space long ago, but a part of me dreads the finality. It’s complete utter silliness, but there you have it. Maybe it will have to wait until I feel I’ve found an adequate replacement. A game that will put an end to the homesickness, maybe. Oh, to be young again and foolish! How do you decide it’s time to dump an MMO? Are you among those who hold on to MMO installs for purely sentimental reasons? Can you imagine not uninstalling a game despite no intention of returning? Maybe you’re a frequent re-installer? Or still of the rare, MMO-monogamist persuasion? Is there any symbolism in the “mighty uninstall” or is it generally overrated (and silly)? Any MMOs currently “rotting” on your PC (fess up!)? It would actually be very interesting to know how long WoW players (veterans?) take on average, before ever choosing to uninstall, if at all. I’d wager that in this particular case, my own hesitation is not so unheard of. Before the weekend, a little comic I played around with (I added a link to the original version in the caption, just so my copyright infringement guilt feels a little lighter). Altnotes.com where Gilded has recently set up camp with a new MMO blog. He focuses on analyzing and discussing modern MMO design and mechanics in general, adding a new voice to the circle of blogging MMO critics in the blogosphere. In the spirit of supporting our newcomers, check his thoughts out sometime, it’s worth it! Rift: The little things over at massively; I’ve always been one to look for the little things in my MMOs, the silly, fun and secret along the way which are all too easily missed in the rush. A formidable list with the very same focus, saves me creating one for Rift then, I guess! Enjoy your weekend everybody, be it inside or outside those virtual worlds we all love so much! I haven’t been entirely honest about why I’ve taken up Rift in some of my past articles. Yeah, Rift is all that: new, shiny looking, a solid package, interesting talent combos, more cooperative and epic events, zomg-awesome dyes for your armor. But it was none of those things that actually won me over to start playing the game. Rift’s major selling point for me was the bard class. BARDS!!! THEY GOT BARDS! That utterly under-represented class in fantasy MMOs, oh I love it so much! I don’t know what it is exactly, I’m not a musician in real life (I play the flute a little but who doesn’t), but there’s something incredibly appealing and romantic about playing a bard in online games. I think it’s the whole imagery: that wandering hermit with the lute on his back, that solemn and thoughtful storyteller in your adventurers party, playing his tunes steadfast in the midst of battle, bringing courage and hope to the hearts of his allies, filling his enemies with dread from afar. Bards are subtle, bards work their magic in different ways. Bards make any camp fire a cosy place. Notice what’s wrong with this picture? I’m not playing a bard in Rift, I’m playing a pyromage. I’m really sad about it too and wonder whether I should give things another go. Unfortunately, when testing bard for a couple of levels, I didn’t enjoy Trion’s interpretation of them at all. For one thing, bards are part of the rogue/hunter archetype in Rift which are mehhh physical DPS. Now, I could probably live with the melee thing since a bard (in my head) is likely to swing a dagger or mace of sorts, once the enemy has closed in on him. Avoidance certainly works there too. But a hunter / archer / pet class? Yet the worst thing wasn’t that creating a bard forces you to combine with these subclasses: the really off-putting part in my opinion was combat itself (to be fair, I did only play the bard solo). Playing your tunes is super-hectic: wooops, there’s your lute, it’s gone so fast you can easily miss it (when buffing)! It doesn’t sound really swell either. And then, once you actually go offensive, you’re literally shooting the enemy with notes and staves as if they were just another projectile, arrows or fire bolts. Eugh! Okay, music IS waves but like this you’re really pushing the whole idea of tunes harming the opponent “physically” which is silly. I liked Square-Enix’ take on bards in Final Fantasy XI: There were flutes, harps, horns and cornets to equip and songs to learn in abundance, usually working as AoE in a small range, beneficial to specific classes only. This would force you to move around often and play different tunes for different people. And bards used MP – their abilities were associated with a magical force, rather than stats such as strength and dexterity. It’s all a matter of preference – and maybe also one reason why we don’t get to see bards too often in MMOs; they’re a tough class to place and give their own spot to in a classic combat setup. Great for lore and role-play, tricky for mechanics and balance? Anyway, maybe I should really give bards another go in Rift. It feels wrong not to play a class that comes with such unique appeal and there’s always that chance that I judged things prematurely. That said, I haven’t actually run into that many Rift bard blogs or posts so far, I’ve yet to find someone passionate enough to convince me. We’ll see. Hirz, my favourite cottage cheese producer, have recently launched a new “summer special” in their product line: cottage cheese with cucumber. Hirz is a Nestlé brand and stands for consistent and traditional products; no fancy stuff, no groundbreaking novelties in the dairy sector, no fixing of what ain’t broken. Their cottage cheese is creamy and light, not too sour and not too bland and comes in two variations – regular and with chives. I prefer the latter because I’m a bit of a rebel. Lately, on an annual base, Hirz has started to launch limited editions to test the waters in their regular customer base a little. A couple of months ago they introduced their “cottage cheese & wild garlic” special, which they ran temporarily on smaller production volume, parallel to the top sellers on the shelf. Depending on more positive or negative consumer feedback, quantities would be increased and the sale of the new flavour would be continued. Maybe it would even make its way into their main product line. A small financial investment for a huge company. Virtually no risk. How jealous game developers must be of cottage cheese producers. Ever since Trion have launched their new MMO, they have faced colliding opinions on their new product. First and foremost the “die-hard Warcraft front”, consisting of all those players either too scared to actually give Rift a try or just generally picky and negative when it comes to anything without a Blizzard stamp on, ironically enough complaining that the new MMO is way too much of a WoW clone. Then, there are the more moderate critics who genuinely look for the new and will find it in Rift, acknowledging that it’s by no means as novel as it feels new, but comes with great potential and a promising outlook. At the other end of the spectrum are the “WoW burnouts” who will over-hype anything that isn’t WoW because Blizzard broke an emotional contract of sorts in Cataclysm, and of course a few fanboys you will find for any game in existence (and who therefore are negligible). In his most recent blog post, Wolfshead elaborates on his ambiguous feelings about Rift and why he believes the game lacks polish in the really important areas, mainly its selling point and signature concept: rifts. After all, it’s the rift events and dynamic content that set Rift apart from other MMOs such as World of Warcraft and make the game appealing to MMO veterans who look for new, cooperative concepts and online worlds that feel altogether more “alive”. But Trion still has a lot of work to do in that department, from basic balancing issues to the question of impact and replay value. As current subscribers we can only hope for future improvements there and maybe marvel about why the devs wouldn’t spend more time and focus on this subject prior to Rift’s launch, rather than on delivering the standard MMO package that Rift has no doubt provided. The answer isn’t really a though one, though; how far do you dare go with progress and novelty, when facing such a competitive market that is at the same time so shaped by tradition and committed to genre? How far can you risk the initial and crucial success of a one-time launch by deviating from what a great part of today’s MMO players consider the standard, basic package? How do you balance learning from past success with expectations of innovation? And not least, the eternal crux of most developers: how much more time / financial means do your investor and publisher grant you? Which other cooks are spoiling your broth with their deadline pressure and revenue strategies? Unfortunately this will always be a big factor, not only in determining the launch date for a new MMO but essentially its entire fate from there. A successful launch is absolutely crucial in a bracket that relies so heavily on convincing players to subscribe long-term and needs to achieve such during a short, very sensitive initial “grace period” when MMO players are curious and willing to give a new game a try – but also sceptical. Many promising projects, such as Aventurine’s Darkfall never got the chance to develop their game concept fully, because of lacking financial backup and added launch pressure. Any reasoning here gets stuck in the same vicious cycle: launch an unfinished game because you cant afford to keep developing -vs.- don’t launch a game and run out of money before launch. Your investors want to see cash. You too, really need cash coming in soon in order to continue making improvements. But if you already alienate your player base with a pre-mature launch, who will keep paying? In the long run, you are always doomed to fail. Trying to calculate the financial risk arising from either a post-poned or pre-mature launch, is depressing business. Now, Hirz never had that problem. They keep their cash cow flowing while launching a new product ever so often, checking if people like it and removing it again from the market after a couple of months. They can afford to have customers test a demo, they can launch limited “samples” without any considerable risk. The wild garlic edition disappeared from shelves after a couple of weeks. I sampled the cucumber version last night and I can’t say that one’s a keeper, either. Lucky for Hirz, they didn’t already spend all their cash and the last three years of development on cucumber edition. Phew. There are no samples in the world of games; there is early testing in closed circles, there are alphas and betas, and thanks to the interwebz there are easy to download demos of existing games today, allowing a more informed choice on whether to buy or not. For MMOs, we got trial accounts – but that’s not really the same as samples. Imagine Trion had the chance to test the waters first by launching a free, limited edition of Rift for a few weeks, to see what their potential customers really enjoy. A Rift “mid-launch” of sorts, only half-way through production, where players could experience the first 15 levels and starter maps, a glimpse of all core mechanics such as questing, talent specs, rifts and professions. Let people play like that for 1-2 weeks, then shut the servers down, assess feedback and re-focus. No half-assed, feel-good betas for an already finished game one month before launch, but a real sample of your work in progress. Real feedback and direction, real customer centricity. And much less risk to yourself. I’ve no idea how applicable such food business models are for online game development; it’s obviously a ridiculous comparison (I enjoy nonetheless). MMOs rely heavily on the entire framework of a consistent, existing world – I don’t believe they get developed in independent, modular “bits and pieces”. Blizzard probably couldn’t have launched a “WoW: Elwynn Forest sneakpeek”-edition before creating most of the game first. Then, there’s the whole copyright and NDA fuss. That’s not the point though; there’s always room to optimize and re-think business and development strategies – if we ask for new concepts and gameplay innovation, we might as well ask for that too. It strikes me as utterly bizarre that a business dealing with so many crucial factors and dilemmas, such huge time and financial investment involved and so large an audience to recruit, wouldn’t think of ways to test their market and survey their potential playerbase’s wishes before launching a fully fledged, multi-million enterprise meant to last for several years. All this care for cottage cheese but not for online worlds? You lost me at multi-million. P.S. Cottage cheese rules! Especially on Skorpa (Swedish crisp bread). It appears that ever since Rift launched, there’s been a real pandemic of hacked accounts around – to a degree that is baffling considering this is a new MMO which only just launched a few weeks ago. I’ve not ever had anyone hack accounts of mine in the past, but then I take all sorts of security measures on my PC (as far as that’s possible) and I’ve used a WoW authenticator for years, being paranoid that the same thing might happen to me like to several mates. If you’ve invested a lot of time into an MMO account, it’s a horrible idea that someone else might break into it and tear it apart. I even had a good friend quit the game for good over this. Many bloggers have complained about Trion’s lack of security measures for Rift, some blaming them for the 16 characters password limitation. Personally, I don’t think this is the real issue, but then I’m not an expert in password security. I’ve commented a few times on other pages though, that I can’t understand why Trion would launch a new MMO without any security measures or authenticators being in place from the start. Surely, Blizzard’s past troubles in this area have shown everyone else how important this is? If you are Coin Locked, simply click on the Coin Locked icon and enter the code found in your email from Trion. You will only have to enter the code once for each computer at a given location. If you play from multiple locations, or on multiple computers, you will have to enter your code the first time you log in from each new location or computer. If you log in and your account is coin locked, check your email! Someone may have logged in from another location with your account. It sounds simple enough – although I’ve no way of judging how secure this really is (am happy to be educated). It appears to be a good way to manage account security to me, without the need of some sort of “hardware” or extra tool involved. That said, they’ve also announced in the Email, that they’re currently looking at options for additional two-factor authentification, in form of a smarthphone app or other. I reckon that will be for free. Ever since I subscribed for Rift, I have been spammed “Preorder Registration Information” Emails, coming from a no-reply account at direct2drive; I must have received 50 of them by now and haven’t really found any way to stop this (although I did contact them directly, but received no reply). I don’t assume these are phishing attempts, in all likelihood it’s just a mistake or auto-notification of theirs gone bonkers. Still, I’m really glad to hear Trion finally introduced a coin lock system, for what its worth. I had this long wall of text ready to publish yesterday, on how much I look forward to play future MMOs without the holy trinity – and then blogger ate my post and I couldn’t find any way to recover it – of course. *sigh* That convinced me I should rather be playing Rift than write silly posts, y’know basically a sign from above, and now I’m not even sure whether I have the heart to rewrite it all. I hate it when that happens, where’s the time machine when you really need it? Anyway, there I was trying to break down Rift’s class system in a comprehensible way to one of my mates the other night, feeling ready to jump off the next cliff after approximately 10 minutes. Yeah I get it, the class system is a little more complex than in World of Warcraft – that’s why it’s fun. But it’s really not all that hard to understand, a trained monkey could grasp the concept pretty soon. To which my mate then replied: “what about Warcraft players?”. Before you reach the inevitable conclusion that said comment was actually offensive, it was made by somebody who’s played WoW himself for a long time – and arguing with such deprecating self-irony is kinda hard. I have also been told that I am made of pure evil for successfully luring people into giving Rift a go, making one of them buy an new shiny PC just to be able to run it properly, so apparently I don’t get to argue. Riiight, don’t blame me now, MMO players are all the same desperate bunch, muah muah! I get where this is coming from though: when you jump into Rift, there’s all that talk of callings, souls, roles, subclasses, planar charges and ye olde Warcraft player that you are, you’ve simply forgotten all about how it feels to start a brand new game and that initial confusion is part of the experience (and fun). There are currently a few Rift resources in the making, but nobody likes to go and search half-baked databases when starting off with a new game. Also: Wiki articles are often cryptic and have the potential to scare you off rather than to help – now that would be a real shame. So, what is it with this class-soul-role mumbo-jumbo in Rift? Here’s my breakdown in 3 easy steps. There are 4 main callings or class archetypes in Rift: Warriors, Rogues, Mages and Clerics. This is the initial choice you will make when creating your character and cannot be reversed at any point in the game. Each of these archetypes offers 8 sub-classes or talent trees which are called souls in Rift. Your very first quest at level 1 will let you gather your first out of 8 souls. Don’t worry about that choice too much because already at level 13 you will be able to get them all and switch around. Your character can equip 3 souls at any given time. That means your talent chart looks very similar to WoW where each class has 3 trees to fill points in. The main difference is that you have 8 trees available in Rift and it’s your choice which ones to play with and when. The game wants classes to have access to a lot of variety in playstyles and encourages you to experiment and respec often. So, if you roll cleric in Rift for example, you can play any combination of 8 souls: you can be Druid/Cabalist/Warden or an Inquisitor/Justicar/Sentinel – just to name two options. It’s up to you what “trinity” to set for. That makes for a stunning 56 unique build combinations available (more including PVP souls) per class. And then it’s still up to you how you spread your talent points within those combinations. Ideally, you still want to focus on one main tree at least, in order to get access to the powerful endtalents. At some point you will tire of respeccing in order to switch or re-build your specs; you will want to have different talent and soul combinations ready to play, depending on whether you play solo, in a 5man or PVP. Every Rift class has variety of functions available, from tanking, to dps, support and healing. This is where roles come into play: a role is Rift’s equivalent to WoW’s dualspec, it let’s you save more than one talent spec at a time and switch between them easily, anytime and anywhere. Your first extra role will cost you 30 gold which roughly equals 30 WoW silver – so it’s very cheap. You can both respec and purchase extra roles at your class trainer. Note that while you’re leveling up, you must buy your new skill ranks individually for each spec and can only do this while the role is active (so it’s a good idea to switch while you’re at the trainer). Furthermore, you do not only have two roles available in Rift, but can get up to a total of 4 saved talent builds which you can re-name individually to keep track. This is another testimony to Rift’s class versatility and flexibility. Knock yourself out! That’s pretty much it! Not so hard now, is it? If you’re still looking for more info on something, have a look at the following, more and less useful Rift resources and Wikis. Keep in mind that the game has only just launched while browsing.